Not really a sequel, but an extra upgrade pack was planned for this popular title by Julian Gollop, and mentioned in the original game’s review. 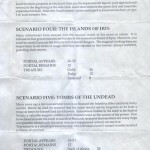 The expansion pack was to include extra scenarios to be integrated with the original game. However, nothing ever seemed to had surfaced of this pack, and it had since been forgotten. Although not a full game in itself, it would be nice to find any new scenarios by Julian if there had been some created but never released. Could they be saved? Well, yes… thanks to Mat Allen, we discover that the game was released and possibily in limited numbers too. He has kindly provided TAP images and scans which we can present to you here! As you can see, the game comes with no packaging… this is because people had to send a cupon to get the expansion pack, which maybe not many people did. Did this get a full release, or is this a very small leak of the expansion pack? This could well be case closed already, and not technically a GTW, but this entry will remain for archivial purposes. Another note, thanks to research by GTW regular, Peter Weighill, we discover that the C64 coder was infact Nick Gollop, and not Julian (He only did Spectrum and Amstrad versions).